Being a parent means having to make important, possibly life-altering decisions every minute of the day. Taking care of your children’s nutritional needs can be a particularly big challenge, especially if the little ones are too young to clearly vocalize their needs and desires (not that it gets any easier when they grow up). There is much to learn about what children need to eat at every stage of their development and there are consequently numerous dilemmas that you need to deal with on a daily basis. Little Spoon is a California-based meal delivery service designed to lift a huge weight off your shoulders by providing fresh, organic blends that are in perfect accordance with your child’s nutritional and developmental needs. 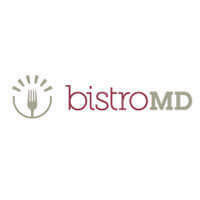 The blends are created in consultation with a team of experts on feeding babies and toddlers, including a professor of pediatrics, a pediatrician, and a registered dietitian and certified dietitian nutritionist. 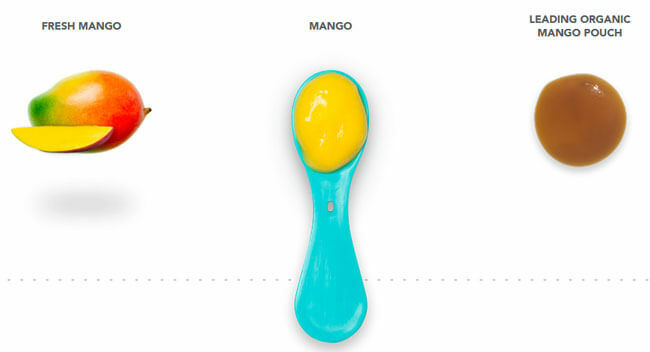 In this Little Spoon review, we bring you all the most relevant information about this new meal delivery service for babies. Once you decide to become a Little Spoon subscriber, you get to fill out a questionnaire that allows its team to get to know your child a bit better. The information you need to provide includes your child’s name and birth date, as well as nutritional preferences. You will be asked whether your child eats pureed food, finger food, a combo of the two or has not yet started eating solids and whether you mostly make the food yourself or buy it at a store. You will further be asked to describe your child’s eating style, ranging from very picky to adventurous, and tell the team whether your child is allergic to something and whether or not you want the blends to include meat. After you complete the questionnaire, you can decide whether you want to order 1, 2 or 3 blends per day. You get to choose the blends you want your child to enjoy during the week. Deliveries are made every other week and include two weeks’ worth of blends. There is no minimum subscription duration, so you can skip a delivery, change your subscription plan or cancel your subscription at any time. What we particularly liked while researching for this Little Spoon review is the fact that the blends come with a satisfaction guarantee. Good baby food is hard to come by. Store-bought food often sits on the shelf for too long, is highly processed, and contains a lot of sugar and preservatives. Pouches may be convenient, but they do not encourage the development of oral muscles and prevent the child from touching, seeing, and smelling the food. Home-made baby food is always a good option, but parents do not always have the time to make every meal of the day themselves. 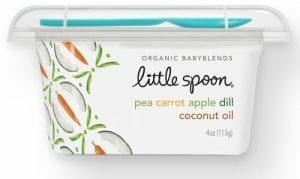 With Little Spoon, you get fresh blends made of organic ingredients that contain nutrients essential to your child’s development during the first years of his or her life. These blends do not contain any artificial products and the use of preservatives and additives is avoided through the application of a technique known as high-pressure processing. This technique eliminates the presence of harmful bacteria and preserves the nutritional value of the blends. The name of the company reflects one of its main goals: allowing babies to learn how to chew and get used to different food textures. By teaching your child to eat with a spoon, you are also reducing the risk of choking and supporting the healthy development of muscles and motor skills. Not only is every blend created with different developmental stages in mind, but every box Little Spoon ships is customized to suit the needs of every individual child. While the company is still unable to provide blends for children with severe food allergies, the blends are made in an allergen-friendly environment. Therefore, they are suitable for children with mild food allergies, although it is recommended to talk to your pediatrician before opting for Little Spoon meals. Every blend comes in a PET plastic container, with a PP plastic spoon included. 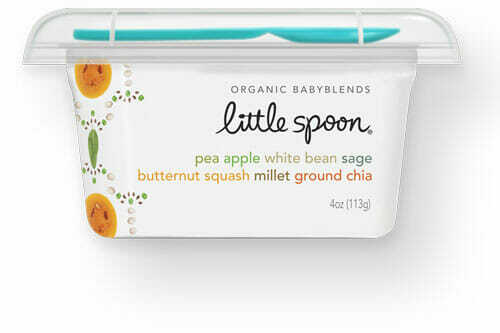 The packaging and spoons are BPA-free, so they are perfectly safe. What is more, both containers and spoons are 100% recyclable. At the moment, Little Spoon offers 26 different baby blends. They can be divided into 4 categories based on the age of the children whose needs they suit. At your disposal, you have blends recommended from 4, 6, 8, and 12 months. There are 3 blends suitable for children aged 4 months or older and these include pear, mango, and apple blends. They boost immunity, aid vision development, alleviate constipation, and help maintain bowel regularity. 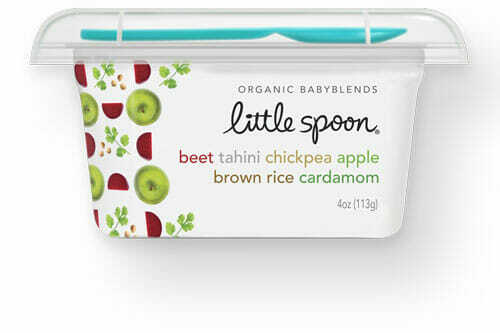 For babies aged 6 months or older, Little Spoon has developed 9 more complex blends rich in vitamins and fiber. They contain the healthiest of veggies and fruit, including kale, beet, spinach, avocado, broccoli, banana, carrot, pea, and pear, as well as other good ingredients, such as flax, turmeric, hemp, and spirulina. All of these ingredients perform various important functions, such as controlling water balance, maintaining healthy blood pressure, aiding bone development, and supporting nutrient absorption. For babies aged 8 months or older, the company offers 8 blends rich in healthy oils, seeds, veggies, and fruit. These stimulate healthy brain function, build up the immune system, protect children from infections, and have positive effects on all major organ systems. Finally, Little Spoon offers 6 blends suitable for children aged 12 months or older. Apart from the ingredients present in other blends, these include ingredients such as brown rice, beans, and corn, as well as various herbs, which support the digestive system, promote detoxification, and contribute to the development of healthy bones, while also possessing anti-inflammatory and anti-viral properties. While the selection of blends does not change on a weekly basis, new items are regularly added to allow children to experience new flavors and reap the benefits of different ingredients. Although not too numerous, the blends are carefully designed and provide babies with everything necessary to keep them happy and healthy. We hope that the company will soon offer even more options for the youngest ones. Little Spoon baby blends do not have individual prices. The price you pay per blend depends on the number of blends you order per week. If you choose to order 1 blend per day, you pay $3.92 per blend. For 2 blends per day, you pay $3.50 per blend. Finally, if you decide to order 3 blends per day, you pay just $2.97 per blend. There are no extra costs, as shipping is free of charge on all orders. Until recently, Little Spoon blends were only available in some parts of the US and customers were put on a waiting list, so they had to wait for an invite before they could order. Fortunately, the company is now able to ship throughout the US, except for Hawaii and Alaska, and the blends are shipped as soon as you order them. To make sure Little Spoon meets all your standards and expectations, it is important to know its biggest advantages and disadvantages. With a short overview of its pros and cons, you can easily decide if Little Spoon is the right meal delivery service for you. With Little Spoon, you get delicious meals prepared by pro chefs at affordable prices. To find out what kinds of delights you will receive in your delivery, we have chosen a couple of sample dishes that accurately represents its offer and can help you decide if it is the right service for you. Little Spoon gives parents a wonderful opportunity to provide their children with only the healthiest food that perfectly suits their needs and aids the healthy development of the entire body, including the brain and central nervous system. 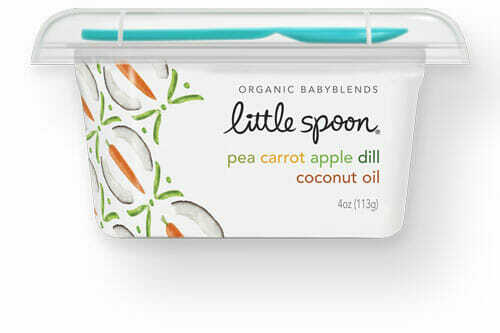 As seen in our Little Spoon review, everything is fresh, organic, and non-GMO and approved by experts with extensive knowledge on the needs of babies and toddlers. The prices are surprisingly reasonable, considering the quality, and shipping is free of charge. We are glad to see that this lovely service is thriving and now offering its blends to parents and babies throughout the contiguous US. Our ratings are the result of an objective and independent evaluation of Little Spoon, generating the final rating that reflects the overall quality of the company. Ratings may change as the service changes. Little Spoon customer rating based on 16 customer reviews. I've received 3 deliveries so far and my little one gobbles it up. She's 8 months old. Love the convenience and variety of blends offered. I have not experienced any delivery issues like some other reviewers. They use FedEx for deliveries, so I suppose sometimes delayed or damaged shipments are out of their control. I've had a few questions about the food and feeding (first time mom!) and customer service has always been quick and great about answering me back. My son has been happily eating food pouches from Happy Baby, Ella, etc. Every single food pouch lapped up with no issues. He is extremely interested in food, 97% in weight and has never rejected any food bofore. So I figured, let's take the risk and order a huge box from Little Spoon.I don't know what they put in there but it's vile. My son has been gagging everytime I put a spoon in his mouth. This has never happened. I tried it and didn't take to the taste either.The owner is also extremely defensive when you ask her for a refund of all unused portions. So they also don't get customer service.It is amazing that this company is actually VC-backed. Please beware and stay away. I was a little confused by this too, but saw that you can see the entire menu on the website before you place an order. And you can change the meals at anytime if you do not want what they automatically suggest for you. There is a ton of variety. I wish I read the reviews before I gave them my credit card info. This company is a spam. In their system does not let you see the food options until you give your credit card information and everywhere says you can see the shopping cart before ordering, making you feel you can cancel if you don’t want to order. Immediately after I signed up I looked at the options for my 5 months old. And it is $42 for some jars of apple, pear and Mango. This is more than easy to make at home. I was hoping to get more variety with some seasoning which seems like is suitable for 6 months and older. So I contacted them immediately and asked to pause my account until my baby is 6-7 months . I even didn’t want to cancel. But they refused to refund me and they tell me I’m stuck with the first shipment!! They are not looking for loyal long term customers. I will not continue my membership after this first impression which lead me here to read other reviews. I will contact my bank to cancel the payment. My babe is loving her Little Spoon blends and I love that she is trying all sorts of new ingredients each week! 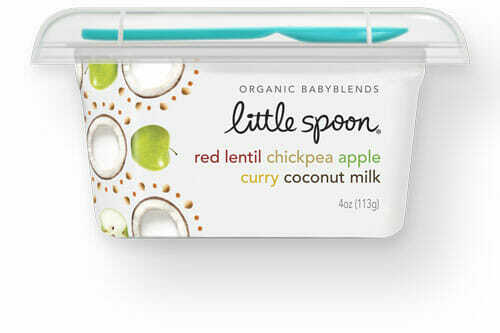 My kid likes to eat little spoon blends, but I wish there were more flavors to choose from. I want more variety in my baby's diet, so I really hope they'll add new flavors soon. Everything else about the service is like advertised and the customer support people are nice as well. I've been using Little Spoon for a couple of months now, and I love what they are doing. As a mom who has to work and take care of her baby, they are a true godsend for me. My baby of seven months likes all the blends we tried and I'm just happy knowing that I get to feed my kid good food. I wish they were a bit cheaper, though. Worst company and worst customer service stay away!!!! Order came hot, ice was all melted, food was bad. Owner refused to give a refund of original payment by credit card; would only give a credit on account. Wrote back with a snarky comment. Go to Once a upon a Farm- their food is great, they have great customer service and are kind and care about there customers. The owner of Little Spoon needs to check her attitude and go find another job. So rude. Your selling baby food lady, care about your customers!! She’s just in it for the money!! So sad. Run far, far away.!!! You recommended Once Upon a Farm, but failed to mention their baby food contains Heavy Medals such as arsenic, lead, etc. Sorry you had a bad experience with little spoon, but do your research before you suggest an alternative. Terrible service, first delivery came late so the freshness of the baby food is questionable. It gets better when for some reason two accounts where open for my one household, so they now want to send me another shipment of food a week later, which i will be refusing. I cancelled both my accounts promptly. STAY FAR AWAY FROM THIS COMPANY!! We found 0 verified Little Spoon discounts for April, 2019. There are no Little Spoon coupons or discounts right now. If you like Little Spoon but aren’t sure whether they are truly the ideal choice for you, you may want to take a look at our comparisons below to discover if one of their competitors is more suitable for you.